MIDDLEVILLE, Mich. (AP) — U.S. Army Sgt. Michael Gower looked over his shoulder as a bright light shined through one of the hatches in the troop compartment of the military vehicle he was sitting in. 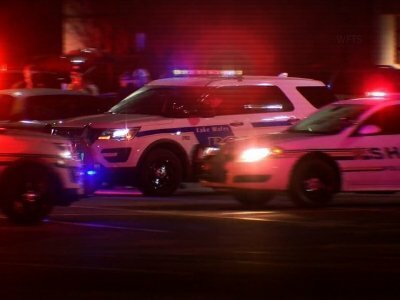 Royal Canadian Mounted Police Superintendent Peter Lambertucci said officers found elements and traces of homemade improvised explosives and the youth suspect was reportedly involved. The law prohibits identifying him due to his age. SACO, Maine (AP) — Federal authorities have arrested a Maine man who they say tried to sell an undercover agent a homemade bomb. The Bangor Daily News reports the 23-year-old Saco man was charged with possession of an unregistered explosive device and remanded to the custody of the U.S. Marshals Service Wednesday. BEAVER, Pa. (AP) — Aaron Elchin last spoke to his brother, Air Force Staff Sgt. Dylan J. Elchin, Saturday via Facetime from Afghanistan. LONDON (AP) — British counterterrorism police are investigating after two devices were found in an unoccupied apartment in northwest London. Police said Wednesday the "initial assessment" is that the items were improvised explosive devices. Police said the devices were made safe and neighboring apartments that had been evacuated as a precaution have been re-opened to occupants. MINNEAPOLIS (AP) — Federal authorities are offering a $3 million reward for information leading to the arrest and conviction of a man wanted for illegally obtaining U.S. technology that was later used in improvised explosive devices in Iraq. Authorities say 55-year-old Hossein Ahmad Larijani is believed to be in Tehran, Iran. He was indicted in 2010 on charges related to exporting radio transceiver modules made by a Minnesota company, which has not been publicly identified. NEW YORK (AP) — The Florida man accused of sending pipe bombs to prominent critics of President Donald Trump was indicted Friday on charges carrying a potential mandatory penalty of life in prison. OCALA, Fla. (AP) — A Florida man who plotted to blow up Target stores along the East Coast has been sentenced to 40 years in federal prison. Authorities said Mark Charles Barnett of Ocala thought the explosions would cause the company's stock to plunge, allowing him to cheaply acquire shares. SOUTH HAVEN, Mich. (AP) — An improvised explosive device that police say appeared to be made from modified commercial fireworks has damaged a home in southwestern Michigan. The device was outside the home when it partially detonated about 4 a.m. Friday in South Haven. A window was blown out, but no injuries were reported. South Haven police say investigators don't know if people inside the home were targeted or if the incident was random. MOREHEAD CITY, N.C. (AP) — North Carolina's governor has ordered flags lowered to half-staff in honor of a soldier killed in Afghanistan. MOREHEAD CITY, N.C. (AP) — North Carolina's governor is mourning the loss of a soldier who died in Afghanistan. Gov. Roy Cooper said in a statement late Friday that he offered the state's "deepest sympathy" to the loved ones and fellow soldiers of Sgt. James Allen Slape. The 23-year-old from Morehead City died Thursday from wounds caused by an improvised explosive device. Cooper said National Guard members "leave their homes, their families and their jobs and put their lives on the line for us." COLORADO SPRINGS, Colo. (AP) — Six Colorado Springs police officers were injured when a bomb simulator detonated while they were training at Fort Carson. NEWARK, N.J. (AP) — An Israeli man found with a fake bomb at a New Jersey airport earlier this month won't face criminal prosecution. Port Authority of New York and New Jersey police had taken 50-year-old Alon Felman into custody at Newark Liberty International Airport on Sept. 4. He was accused of creating a false public alarm and interfering with transportation after a replica of an improvised explosive device was found in his carry-on luggage during a screening. ANKARA, Turkey (AP) — Turkey's state-run news agency says an improvised explosive device believed to have been planted by Kurdish rebels has exploded on a road in the country's southeast, killing two government-paid village guards. Anadolu Agency said two other village guards were wounded Wednesday in the explosion in the mainly Kurdish-populated Sirnak province, near the border with Iraq. Anadolu said an operation has been launched to catch the perpetrators. PHOENIX (AP) — A Nov. 7 sentencing hearing has been scheduled for a Syrian man convicted in Arizona of conspiring to use a weapon of mass destruction and other charges. Authorities say Ahmed Alahmedalabdaloklah (AL-ah-med-AL-ab-dahl-OK'-lah) made a key component in improvised explosive devices used in attacks against U.S. soldiers during the Iraq War. He was accused of making circuit boards used to remotely detonate the devices for the 1920 Revolution Brigades. TULSA, Okla. (AP) — A federal grand jury has indicted a Missouri man accused of having a pipe bomb at an apartment in northeastern Oklahoma. Authorities say Delaware County sheriff's deputies were called to Cole's apartment in Afton after the landlord discovered a suspected improvised explosive device. TACOMA, Wash. (AP) — The Army says a Green Beret from Joint Base Lewis-McChord died from injuries sustained in an explosion while serving in Afghanistan on his fourth combat deployment. The News Tribune reports 36-year-old Staff Sgt. Reymund Rarogal Transfiguracion was on patrol in Helmand province when he was wounded by an improvised explosive device last Tuesday. WASHINGTON (AP) — An Army special forces soldier has died from wounds he received earlier this month in Afghanistan's southern Helmand Province, the Defense Department said Monday. LEXINGTON, Ky. (AP) — Fire officials say three people were injured in an explosion during an estate sale at a house in Kentucky's second-largest city. News outlets report investigators said the blast was caused by an improvised explosive device made to look like a lighter that went off when a shopper picked it up Friday. Lexington Fire Department Battalion Chief Brad Whittaker described it as a "low-level explosion" that caused no structural damage inside the house. SIOUX FALLS, S.D. (AP) — Authorities say they discovered bomb-making materials when they arrested a Sioux Falls man suspected in recent burglaries. Minnehaha County sheriff's authorities served a search warrant Tuesday at the apartment of 43-year-old Mark Einerwold and found compounds that, when mixed together, form an explosive. PHOENIX (AP) — A Syrian man who was convicted four months ago in Arizona of conspiring to use a weapon of mass destruction and other federal charges is set to be sentenced on Sept. 18. BISMARCK, N.D. (AP) — Authorities evacuated the Morton County Courthouse after a suspicious package was left near the entrance. The package was discovered just as business was getting underway Thursday morning. The Bismarck bomb squad was called, x-rayed the package and found it contained items consistent with making an improvised explosive device, including wires, batteries and a circuit board. The former boyfriend of a woman killed in an explosion at a California office building has made his first appearance in court. Stephen Beal appeared Thursday in federal court in Santa Ana. The 59-year-old Beal was handcuffed and only spoke to answer questions from the judge. CANBERRA, Australia (AP) — Australia's government said Tuesday that it will upgrade airport security around the country and increase police powers in response to an alleged attempt to smuggle an improvised explosive device aboard a flight out of Sydney last year. The government will spend 294 million Australian dollars ($222 million) on improving security equipment and staffing levels at all major city airports plus 13 regional airports, government ministers said. A 51-year-old southwest Nebraska man was arrested Friday after authorities found an improvised explosive device in his home. The Nebraska State Patrol said troopers and the Hitchcock County Sheriff’s Office found the device while serving a search warrant at the man’s residence in Stratton. The patrol said the man had been involved in a legal dispute with the Village of Stratton. Troopers said they were told that the man had threatened to harm or kill one of the village’s officials. A man was arrested Friday after law enforcement found an improvised explosive device in a Stratton home. A press release from the Nebraska State Patrol said troopers, the K-9 unit, hazardous device technicians and Hitchcock County sheriff’s deputies were acting on a warrant for a residence in Stratton when they discovered the device. WASHINGTON (AP) — The American service member killed this week by a roadside bomb in northern Syria was a 36-year-old Army soldier from Texas, the Defense Department said Saturday. EWING, N.J. (AP) — Two New Jersey state troopers who successfully deactivated two improvised explosive devices following a terrorist attack have received the 2017 Trooper of the Year awards. PARIS (AP) — Two members of a French counter-terrorism force in Mali were killed on Wednesday when their armored vehicle was hit by an improvised explosive device in a border region with Niger, authorities said. PHOENIX (AP) — A trial began Tuesday in the case of a Syrian man accused of supplying a component of improvised bombs used in the Iraq War, with a prosecutor saying the man had sympathized with a group that wanted to use violence to drive a wedge between Iraqis and Americans. Ahmed Alahmedalabdaloklah (AL-ah-med-AL-ab-dahl-OK'-lah) is accused of making circuit boards used to remotely detonate roadside bombs in Iraq for the 1920 Revolution Brigades. OUAGADOUGOU, Burkina Faso (AP) — Burkina Faso's government says the death toll has risen to 26 after a truck hit an improvised explosive device. The government says six women and four children are among the dead in Thursday's blast that occurred shortly after the truck entered Mali from northern Burkina Faso. The government says authorities are working to identify the victims, who were from both West African countries and had been traveling for a weekly market. OUAGADOUGOU, Burkina Faso (AP) — A local councilman says at least 13 people have died after their truck hit an improvised explosive device after entering Mali from northern Burkina Faso. Moumouni Tamboura, who works in Djibo village in Burkina Faso, said Thursday the dead were traders who leave Burkina Faso every Thursday for a weekly market in Mali. He says they were killed near Boni village in Mali. PHOENIX (AP) — Trial has been delayed for a Syrian man accused of making a key component of improvised explosive devices used in attacks against American soldiers during the Iraq War. Jury selection for Ahmed Alahmedalabdaloklah (AL-ah-med-AL-ab-dahl-OK'-lah) was scheduled to begin in Phoenix on Tuesday, but the trial's start was pushed back until Jan. 30. PHOENIX (AP) — A decade ago, military police raiding a Baghdad apartment during the Iraq War discovered bomb-making materials that authorities say contained the fingerprints of a Syrian man now accused of making a key component for improvised explosive devices for a jihadist group that attacked American soldiers. A wounded Iraq War vet created a sculpture. The VA says it’s too real to display.